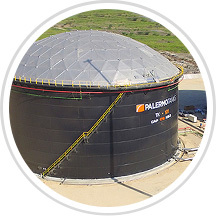 Palermo Tanks is a public access liquid bulk terminal designed and built to the highest technical, operational and HSE standards, that allows handling of hydrocarbons for import and export operations. The tank farm, result of a Joint Venture between Coremar Group (Colombia) and Zenith Energy (United States), is located on a 420 acres Industrial Cluster, in Palermo Municipality, Departamento del Magdalena, in front of Barranquilla, right next to Palermo Port Society, a large scale public use multipurpose terminal. Sitio Nuevo, Magdalena Department, Colombia. 18 acres and room for expansion inside the 420 acres of Palermo Industrial Cluster. 352,000 barrels initially with possibility to expand up to 2.5 million barrels. 2 tanks x 176,000 barrels. Crude, diluents, distillates, asphalt, vegetable oil and chemicals, other hydrocarbons and related liquids. Blending, heating, truck rack, laboratory. East bank of Magdalena River, 11 miles from the river mouth. Berthing positions for vessels and barges with approx. 42 feet of natural depth. Fully automated detection and extinction Fire Fighting System. Automated alignment of vessels for export/import (motorized valves). TMS6 Terminal Management System for handling of volumes in transfer incustody. 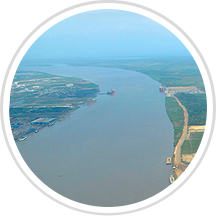 Provide superior port facilities in the Barranquilla area: deeper vessel draft and cargo handling capacity. World class liquid storage meeting highest HSE and operational standards. 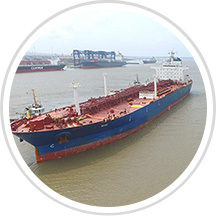 Ideal location as an integration node for maritime, fluvial, and land liquid bulk transportation. 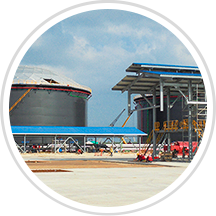 Custom fit solutions for your liquid bulk needs.